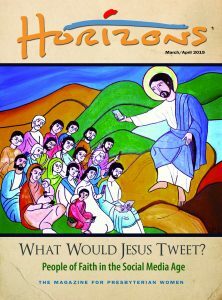 Each year, beginning in 2007, members of St. Charles Avenue Presbyterian Church (SCAPC), New Orleans, have taken copies of the Spanish-language edition of the Horizons Bible study to El Fuerte Presbyterian Church in Cuba. Ann Van Horn, mission coordinator for PW at SCAPC, says, “It was important to take the lessons in their language.” This year, inspired by the Presbytery of South Louisiana’s efforts to bring purified water to their 30-year mission partner, and this year’s PW/Horizons Bible study, Come to the Waters, PW of SCAPC expanded their plans for their annual mission trip to Cuba. 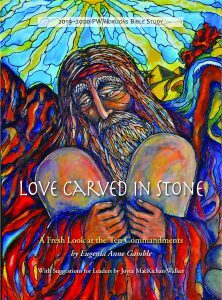 Given the special significance water holds for the Presbytery of South Louisiana (PSL), Laura St. Clair, SCAPC mission trip leader, approached PW in the Presbytery for help raising funds for more copies of the current study for SCAPC’s November 2015 trip. PWP moderator Jan Boydstun joyfully introduced the opportunity at three regional fall gatherings of PW in South Louisiana. The women raised $1,142 for additional copies of Vengan a Las Aguas, the Spanish-language edition of Come to the Waters. By the time PW at St. Charles dedicated $425 of their mission budget to the purchase and transport of the study by Judy Record Fletcher, more than $1,500 was raised, enough for the purchase of 167 books and their hand delivery by trip participants. Kathy Randall, presbytery moderator, shared the good news of the PWP’s efforts at PSL’s October meeting, where the books were dedicated. Water, and the 2015–2016 PW/Horizons Bible study, Come to the Waters, have special significance for the Presbytery of South Louisiana and the Presbytery of Matanzas. In 2011, El Fuerte Presbyterian Church in Cardenas learned their water supply was contaminated. Members of St. Charles Avenue Presbyterian turned to Living Waters for the World (a past recipient of PW’s Birthday Offering) to learn how to install a water purification system there. They installed it in 2012 and trained local people on its use and maintenance. 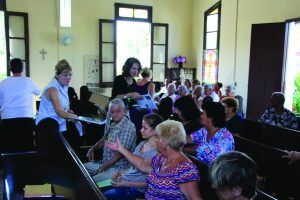 Since then, St. Charles Avenue, University Presbyterian Church and PSL have provided funding and training for four water purification systems at other churches in the Presbytery of Matanzas. Purified water is a major mission focus of the Presbytery of South Louisiana. This focus dovetails with the national emphasis on clean water that PW has explored through past Birthday Offering grants to Living Waters for the World. Five PSL installations (which includes systems sponsored by individual congregations and the presbytery at large) now offer Cuban partner churches water daily. The Living Waters purification system brings long lines of people to El Fuerte weekly for purified water. The systems must be maintained and filters replenished regularly, so more help is needed, but in the meantime, children of the community no longer suffer from intestinal issues caused by impure water. It’s been a mission of love for us to study the same Bible study as our sisters and brothers at El Fuerte, and to help them access clean water.